I had never read anything by Hilderbrand, and this was an enjoyable first experience with her books. It ended on a cliffhanger so I immediately had to start the second book. This was not as wonderful as Strawberry Girl, but it was still quite good. I enjoyed the illustrations as well as the story. The Boxcar Children books really do not hold up that well. I loved these as a kid, but found this one tedious to read as an adult. The mystery was barely a mystery, and the four kids' personalities are too similar. I was going to review this for Old School Kidlit, but may end up skipping it. Another charming and nostalgic read from this series. 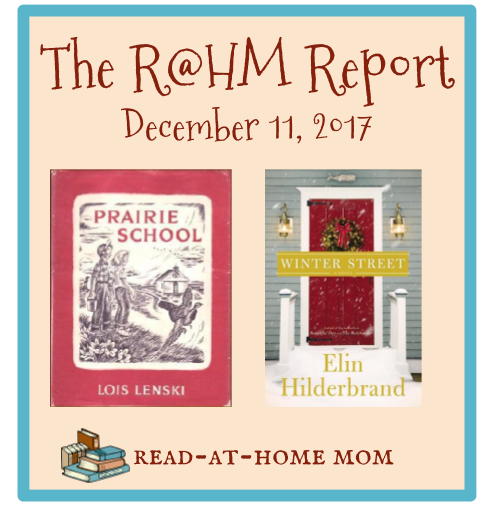 It wasn't quite as wintry as I was expecting, but it did include Christmas and lots of fun ideas for playing indoors when the weather is too cold to go out. This is the sequel to Rabbit Hill. It's good, but not great. Review coming at the end of the month. I'm almost done with this one, and I have really enjoyed it. It's interesting to hear the background behind a lot of the decisions that were made during the filming of the three movies referenced in the title. I really want to see the movies again now! I'm only a few pages into this one, but it seems comparable to the first book of the series so far. I want to try to finish the series before the new year - I usually don't want to read these holiday-themed family stories anymore once the Christmas season passes. I haven't started this one just yet, but it was my original pick for a winter story for Old School Kidlit. I still plan to read and review it even though I have already read several winter titles. Your children's books are giving me flashbacks to my childhood. :) Come see what I'm reading.